The hand of the builder is now upon a house which is of more than passing interest to those who have watched the rapid growth of St. Annes. In May, 1875, there was not a brick house in St. Annes, though the hotel was in course of erection, and the first permanent house tenanted was occupied by Mr. Clement Rawstron in August, 1875. Alpha House, St.Andrew's Road South, St.Annes, built in 1875, converted to shops in 1907. Pictured here in the 1870s, pass your curser over the image to view the same building photographed in 2009. The shops are Claire Hindmarch Opticians, the Bilash Balti and Nigel Shaw Hair Design. That house was in St. Andrew's-road South. It has yielded to the march of progress, and is, along with its neighbour, being turned into shop premises. With this house is associated much that tells of the progress of St. Annes. of a town of 10,000 inhabitants, only celebrates his 31st birthday next Sunday? Yet, such is the case. And this house—Alpha House—is the residence also of Mr. Arthur Rawstron who possesses that honour. to pass through the office was for Mr. Ed.Thomas, landscape gardener, who laid out the St. George's Gardens and the Esplanade. Later a wooden erection was added to the house, and a separate entrance made so that the volunteers, who in those days encamped for training at St. Annes, could write their letters. When this addition was made the letter box was also removed to the front of the house where it remained until Alpha house was discontinued as a post-office in 1882. 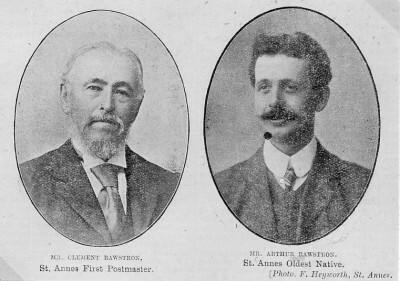 During his postmastership Mr. Rawstron had varied experiences. by the wind, for onlooking for it he could not find it. He at once reported his loss, and inquiries were instituted along, the course on which the letter had travelled, from Fleetwood to St. Annes. Voluminous correspondence followed, and naturally Mr. Rawstron felt very uncomfortable. His integrity was established, however, by the finding of the note in a bush in the garden at "Seafield," Wood-street, by Mrs. Shepherd, who was hanging out, some clothes. The note was none the worse for the rain, to which it had been subjected. 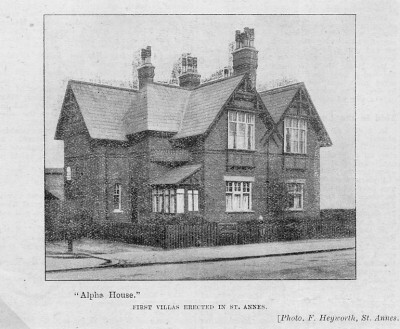 "Alpha House," it will be understood, has been occupied the longest by one family of any house in St. Annes. When Mr. and Mrs. Rawstron came to St. Annes they I occupied a wooden shanty on the site;. Smethurst's shop in St. Andrew's road South, and after removing into Alpha House never changed their abode again. Mr. Rawstron evidently believes in the Yorkshire saying that "Three removals are as bad as a fire." A DESERT OF SAND DUNES. Mr. Rawstron came to St. Annes at the age of 41, and he can graphically describe what St. Annes was like 32 years ago. There was really no St. Annes, for there was not a single inhabited house. There was no railway station and no post office; it was a desert of sand dunes. A gang of navvies at work on the construction of the railway was the only sign of animation; and the site of the town afforded no index to the future prosperity of the square-mile of sand. Mr. Rawstron is the oldest member of the Parish Church Choir, having been a member for 29 years, and he has now been made .a life member. Mr. Arthur Rawstron has also been a member for nearly 22 years, and twenty years ago sang in the Jubilee festival at Lytham. Parish Church. Mr. and Mrs. Rawstron celebrated their golden wedding three years ago, and were the recipients of many congratulations. May they enjoy many more happy years amongst us. They have seven children—one daughter and six sons.